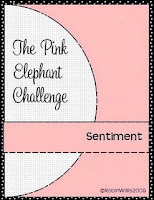 I combined Dawn McVey's Raspberry Suite Color Challenge #7 with The Pink Elephant Sketch Challenge with this card. 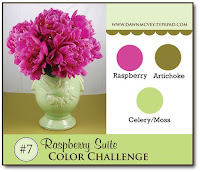 Dawn's colors in her beautiful photograph are Raspberry, Artichoke & Celery. My Big Shot got some great use with this card. I used the sizzlet dies to create the bouquet of flowers and leaves with the Birds & Blooms, and Little Leaves sizzlets. 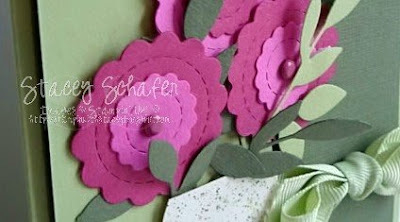 I love those darling flower shapes that mimic a button look! Notice the color spritzing on the vase that was punched with a Wide Oval punch with the top cut off and placed as a base of the vase. To wrap the ribbon through the book-style card, I cut a sliver of the fold to slide the ribbon into and tie to the front. Your flowers look so much like the inspiration piece. Great job. I love the vase, and the flowers are fabulous. They're the best kind...don't need water and I can't kill them! What a beautiful card. I think the bow makes it just perfect. Beautiful card - the colors look great together! So pretty! I love the flowers in the vase! 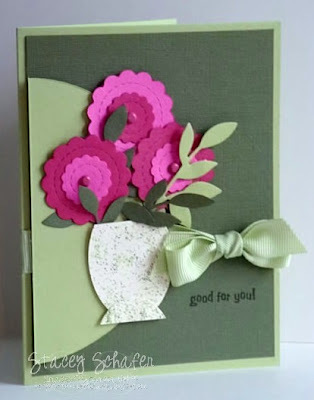 Wonderful card, I love the flowers!! Love all of your fun flowers. Way to go with this fabulous color combo. How clever to re-create her flowers and vase! Really really pretty! I just love what you have done with Robin's sketch - it's fabulous. Oh my those flowers are fabulous!! what a GREAT card!! those flowers are amazing!! This card is amazing! Wonderful! This is amaaaaaaaazing Stacey! Thanks so much for sharing it with us at TPE this week!